The Good Shepherd (Greek: ποιμήν ο καλός, poimḗn o kalós) is an image used in the pericope of John 10:1-21, in which Jesus Christ is depicted as the Good Shepherd who lays down his life for his sheep. Similar imagery is used in Psalm 23. The Good Shepherd is also discussed in the other gospels, the Epistle to the Hebrews, the First Epistle of Peter and the Book of Revelation. Several authors such as Tinto, Barbara Reid, Arland Hultgren or Donald Griggs comment that "parables are noticeably absent from the Gospel of John". According to the Catholic Encyclopedia article on Parables: "There are no parables in St. John's Gospel" and according to the Encyclopædia Britannica article on Gospel of St. John: "Here Jesus' teaching contains no parables and but three allegories, the Synoptists present it as parabolic through and through." In ancient Greek cult, kriophoros or criophorus (Κριοφόρος), the "ram-bearer" is a figure that commemorates the solemn sacrifice of a ram. It becomes an epithet of Hermes: Hermes Kriophoros. In two-dimensional art, Hermes Kriophoros transformed into the Christ carrying a lamb and walking among his sheep: "Thus we find philosophers holding scrolls or a Hermes Kriophoros which can be turned into Christ giving the Law (Traditio Legis) and the Good Shepherd respectively". 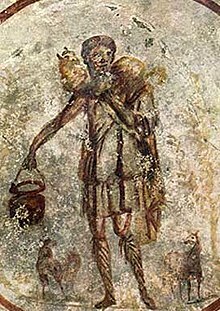 The Good Shepherd is a common motif from the Catacombs of Rome (Gardner, 10, fig 54) and in sarcophagus reliefs, where Christian and pagan symbolism are often combined, making secure identifications difficult. von Hügel, Friedrich (1911). "John, Gospel of St" . In Chisholm, Hugh (ed.). Encyclopædia Britannica. 15 (11th ed.). Cambridge University Press. pp. 452–458. ^ Lowrie, Walter (1947). Art in the Early Church. Pantheon Books. p. 69. ISBN 1-4067-5291-6. ^ Peter and Linda Murray, The Oxford Companion to Classical Art and architecture, p. 475.